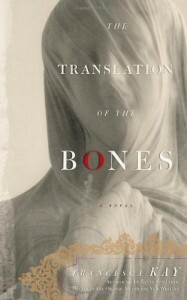 The Translation of the Bones is the first of the books from the Orange Prize long-list for 2012 that I have read, although I plan to read many more. The story centres around Mary-Margaret O'Reilly, a woman with learning difficulties who claims to see blood on a statue of Jesus whilst she is cleaning her local church in Battersea, London. Despite Father Diamond's best efforts, this 'miracle' becomes a bit of a sensation and it sets off a spiral of events that will have devastating effects for the residents of the parish, including MP's wife Stella, Mary-Margaret's housebound mother Fidelma, and Alice, whose son is serving a tour of duty in Afghanistan.The Translation of the Bones is largely a quiet, understated book. The central themes are the many varieties of religious belief (the mircale is left intentionally ambiguous) and the power and devastation of motherhood. The main characters are introduced in ways that make it easy to gain insight into their lives without Kay writing too many words about each. Then about fifty pages from the end the tone completely changes as the book becomes much darker and the reader can see the effect on the characters that have been built up so cleverly throughout the preceding sections. I couldn't put this book down whilst reading the end.My favourite character from the cast was the priest, Father Diamond. When we meet him at the beginning of the novel he is worn down by his inner-city parish and on the verge of a crisis of faith. When something terrible happens in his church, it seems as if his belief will be gone forever, but instead he finds a way back to his faith. His story and quiet belief provides an interesting contrast to the fanatical belief and conviction of Mary-Margaret.The Translation of the Bones is a very British book. Although the main themes can be easily understood by everyone, there are a lot of cultural references that I think would only make sense to Brits - MP expenses scandals, Tony Blair's "we don't do God" comment, the rise of the Conservative party and boarding school culture. The explanations of religion too make sense in the British context and wouldn't be as powerful to readers in more religious countries where faith is openly discussed,All in all I was impressed with The Translation of the Bones, but it didn't blow me away. It might be short-listed, but I don't think this is going to be the winner.